Flamingo Oil and Vinegar Cruet Set Shop the largest selection of Michel Design Works oil & vinegar cruet sets and more - Flamingo Collection. Plus enjoy free shipping on all orders over $50 within the US. Our creative oil and vinegar cruets are made of rustic, irregular glass and have an easy-care surface that looks hand painted. 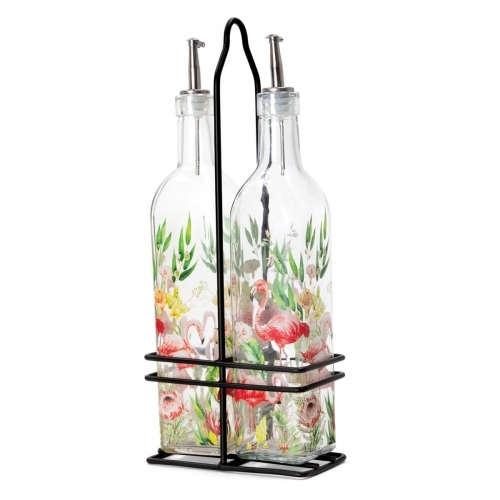 Perfect for kitchen or for outdoor dining. Each cruet has a silver pour spout on a rubber plug, and the set is nested in a convenient metal carrying holder.